Lee Pace Network • Your up-to-date resource on actor Lee Pace! 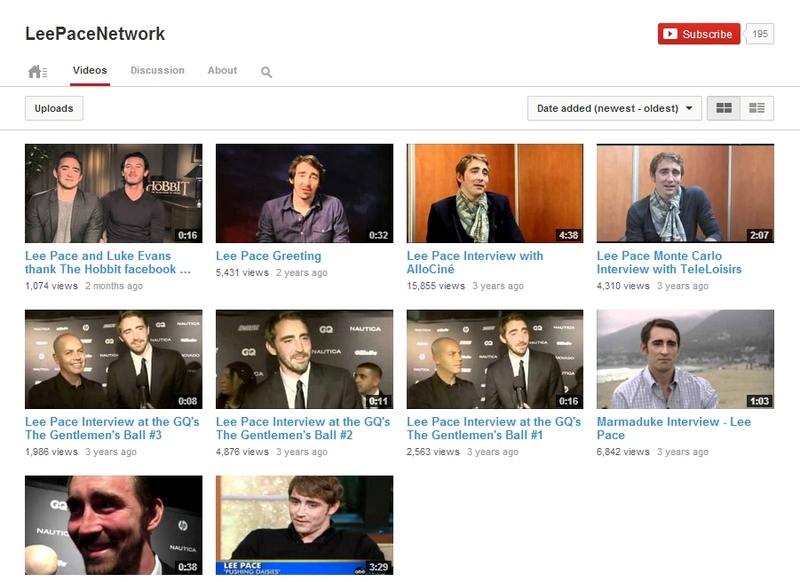 Welcome to Lee Pace Network, your most up-to-date fansite resource on the talented actor. Lee is best known for his role as the lovable piemaker, Ned, in "Pushing Daisies". He can also be seen as Garrett in the "Twilight Saga: Breaking Dawn Part 2" and Thranduil in "the Hobbit". Enjoy your stay. Stay up-to-date on the latest news on Lee and his career. Follow Lee Pace Network on tumblr. Every month there's a new hosting bill waiting to be paid. If you're interested in helping keep the site alive, please consider giving a donation. Any amount, no matter how small, will be greatly appreciated and will be credited on a page (unless you prefer to keep your donation private). All donations will go to domain renewals and monthly hosting bills. Thank you! Comic Con is being held this week and The Hobbit cast seems to be having a blast there. Yesterday the cast answered fan questions and discussed the upcoming The Battle Of The Five Armies movie at their panel. In case you couldn’t be there, you can watch it all below. There are also several new photos of Lee out. It’s been less than a month since I reported the actor joined his first social network site, facebook. Now he can also be found on twitter. Pushing Daisies and Wonderfalls producer, Bryan Fuller, who’s also a very good friend of Lee, welcomed him few hours ago. Make sure to follow Lee here. Lee yesterday attended the world premiere of Marvel’s Guardians of the Galaxy that took place at the Dolby Theatre in Hollywood, California. High quality photos can already be found in our gallery. 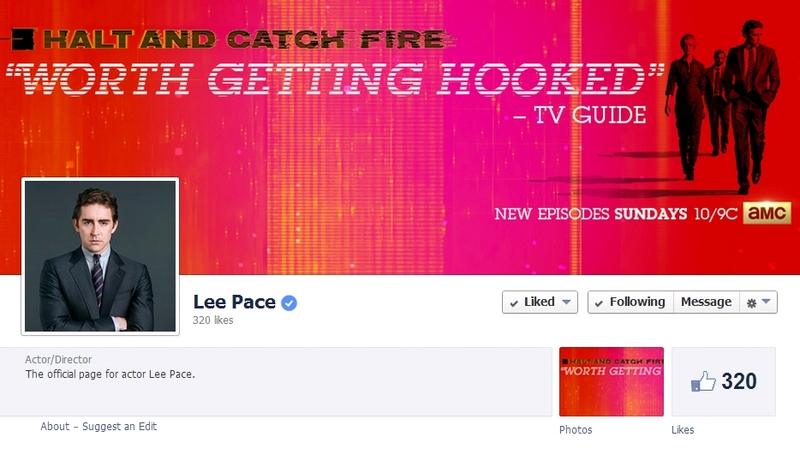 Lee Pace has just finished his first facebook Q&A, done on Halt and Catch Fire official page. But before we go through that, I have some great news to share – Lee can now be found on facebook! Click here to follow his page. Here are the questions Lee answered tonight. A: im a big music fan and the music from the early 80s is so diverse and cool….The Clash. New Order. Micheal Jackson. who else? what are your favorites? Q: Of all characters you’ve portrayed, which one is your favorite and which one is the most like yourself? A: Ill always have a soft spot for the piemaker. Q: Hi Lee. What made you interested in doing this series? And also, any word on more Daisies? A: Joe was a riddle i wanted to solve. i accepted him to be an effective person, he’s a Winner… and i wanted to know more about ‘that guy’. i guess one of the conclusions i’ve come to after filming season one, is that ‘that guy’ is just a myth. Q: Hi Lee! I really want to know, which movie(s) has motivated you to become an actor? A: hanks for the question! When I was 16 or 17, all I did was watch movies. Old Deer Hunter, the incredible movies from the early 80s. The Godfather. At the time, incredible people were making movies and showcasing incredible performances. Robert De Niro. Just incredible actors making movies one after the other. The Graduate. Tootsie. Marathon Man. Q: Hi Lee! When you play Joe do you ever lace traits from other characters you have played in the past? Also who is you’re favorite character you have played so far? Thank you for taking the time to read! A: It’s not intentional but I wouldn’t be surprised if other characters come through. It’s hard to pick a favorite, too. But I love Ned and I loved Roy Walker from The Fall. Q: What are your influences/inspiration for Joe Macmillan – either direct or indirect? Thank you! A: Ivan Boesky. Michael Milken. The infamous corporate raiders of the early 80’s… innovators like Elon Musk, Steve Jobs… those were men that i found very interesting while researching, and Joe might aspire to be… Joe is an unformed person in many ways. Hes like a baby. Babies take up a lot of space. when they laugh, you feel joy; when they cry, you feel worry. they are loud; they get what they need… i guess you could say the same thing about a bear. Q: Could you send me Mackenzie’s number? Q: Hi, Lee! How does it feel going back to 1983? A: Fun. Why not? It’s an exciting time. Q: Will more of Joe’s secrets and personality come out in the next few episodes? A: To Joe, it’s less about secrets and more that he needs to know himself. He needs to go down that path so he knows himself better. How is anyone else going to know him if he doesn’t know himself? Q: How confident is Joe, REALLY. Is his machismo a put on to stir action in others, or is that who he really is? A: I think in a lot of ways Joe’s confidence is all he’s got. Q: Any similarities with Joes character from real Lee? Or are you different and how? A: I don’t share a lot of the values that Joe MacMillan has, but I do admire his balls. I admire how courageous he is. Q: What was your favourite scene in H&CF? A: I love the reverse engineering sequence in the pilot episode. I think you can see Joe’s enthusiasm and his infectious excitement and personality. That’s really key to who he is. Q: Lee, do you have much input in shaping Joe’s personality? Is it a challenge to portray a character who is so driven he is capable of anything? A: It’s fun to play the character. But his ambition is as much to his detriment as to his benefit. What’s the point of getting what you want if you don’t know what you want? Q: Do you have any interest in computers? A: Im a curious person. its been interesting to learn a lot about a subject i know very little about. coding. the mechanics of a mother board. its interesting stuff. A: learning the lines. and saying them in the right order. Seriously, thanks for the question. I’m intrigued by joe as well. and i guess there are a lot of answers. hes not an easy man to understand, and im still learning. his unprincipled ambition. his wild aspiration…. joe is an unhinged man. He lives a fantasy of his own creation. He is tenacious and will not rest until the world matches the possibility that he can visualize… thats not a sane, or respectful way to live. I love Joe. I defend him, even when he does despicable things. Joe knows who he WANTS to be… but he doesnt know who he IS. Who am I, really? Its an important question for a man to face… and its time joe started to ask it. A: hey. thanks for the question. the process is always different. always different inspirations. different cast of characters. A: forgetting what i know. letting go of everything we have gained in the past 30 years… this is a time before computers became ubiquitous tools in our lives…. there is an innocence to the show. New Guardians of the Galaxy image has landed. 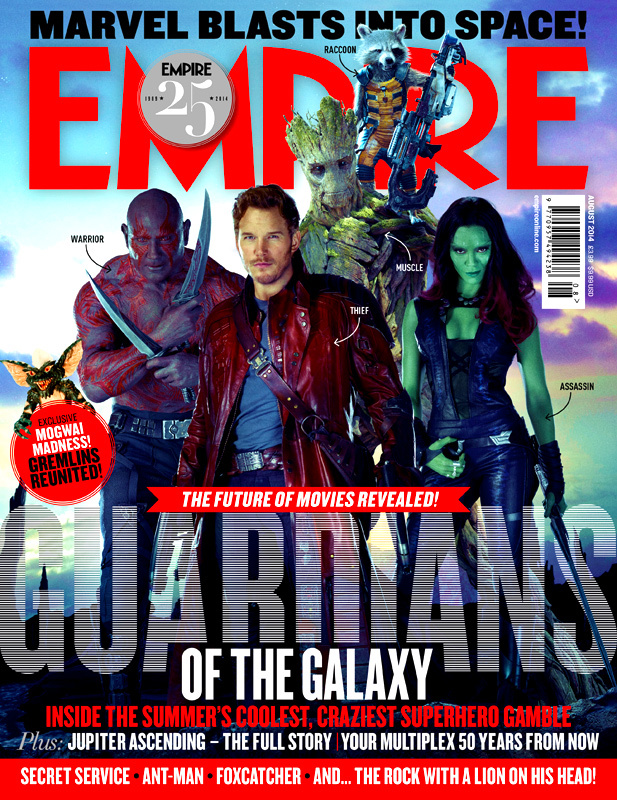 Earlier this week we could see Lee’s costume to details on Empire magazine cover. 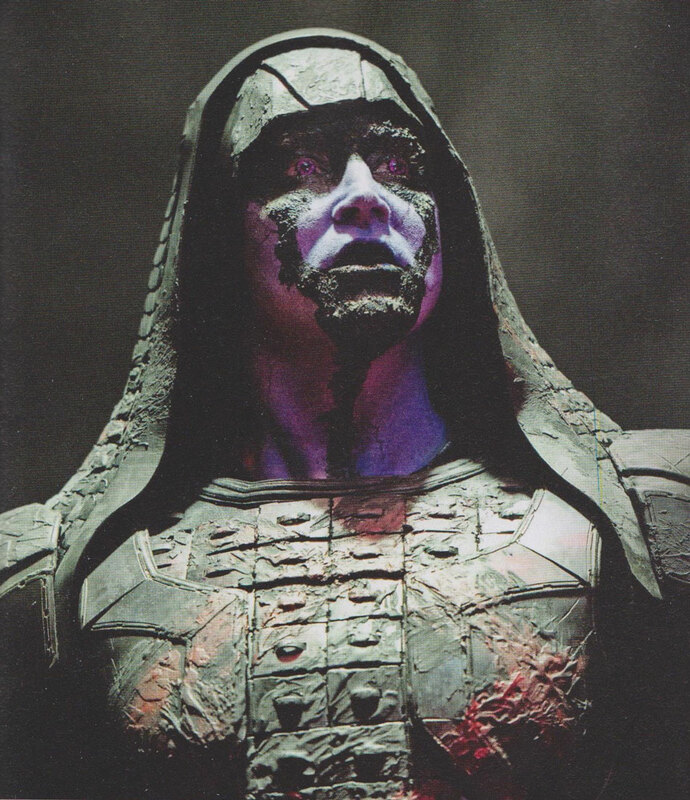 In the newest movie still, you can take a closer look at his make up. Very dark and badass, if you ask me. What do you think? Empire Magazine team has unveiled their two covers that will be featured on the latest issue of their magazine. The main cover, which is the one that you will be able to find in newsstands everywhere, is the one featuring our favorite bunch of unlikely superheroes Star-Lord, Rocket Raccoon, Groot, Gamora, and Drax. 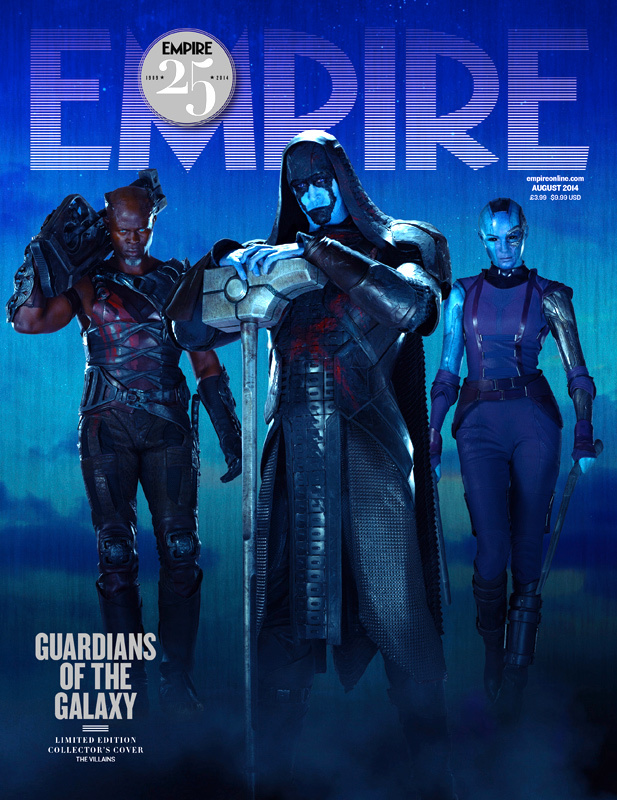 Subscribers will also get a look at the villains of the film; Ronan the Accuser, Korath, and Nebula. The magazine’s set to hit newsstands this week. Joe’s team must overcome internal differences and start building the new machine. The gallery has been updated with new episode stills. Make sure to check them out! Halt and Catch Fire is all new tonight. In case you missed the pilot, you can watch it for free here. The first episode of Halt and Catch Fire premiers on TV in 2 days and Lee’s been very busy doing press. In this interview with TVLINE he chats about the relationship Joe and Cameron have in the show, Steve Jobs and one of his biggest projects up to date, Pushing Daisies. Yes, you’re not the only one missing it. TVLINE | This is your first regular TV series since Pushing Daisies, which was a decidedly different show. What has this experience been like for you? The piece maker could not be more different than the pie maker in a thousand, thousand ways. Everything about it is different — different network, different creators, different love story, different skill set. [Laughs] I hear Joe criticized as kind of an a–hole. But he doesn’t kill people. TVLINE | I find it interesting that you said love story because in the pilot, it doesn’t seem like the most romantic connection between Joe and Cameron. How does that relationship develop? I don’t want to say too much. I probably shouldn’t have even said love story. But she’s irresistible to him, absolutelyirresistible. Meeting her in that classroom is the reason he wants to make that computer. He wants to make the tool — and put it into her hands — that will change the world, because she needs it. If I can take this technology out of corporate America and put it into that girl’s hands, we live in a different time. That’s what Joe means [when he says], “It’s not about the thing. It’s the thing that gets us to the thing.” It’s culture that interests him. TVLINE | This is a fictional show, but you’re talking about an object that is very real and a period in history that’s very real. How much do real events play into the first season, like the rise of Apple? Joe’s aware of Steve Jobs. He knows that he’s working on something very cool on the West coast, and he wants to beat him. Joe believes in himself, believes that he has something to offer, this technology. … Sixty companies were trying to develop computers [at the time] with much more resources than Cardiff Electric. But Joe knows that it doesn’t matter. IBM’s resources, the leagues of white dudes in suits and corporate money and corporate interests – who cares? Who cares about any of that stuff? All we have to do is make the most awesome machine that we could make. And if we succeeded at that, people will want it. Then we’re in. And then we can build the next thing and the next thing and the next thing. Then we’re bringing about the millennium. That’s innovation. That’s the whole spirit that drives Joe MacMillan. And when you know that you’ve got millions of people hungry for this technology that’s going to change their lives, why would I care if Gordon’s feelings are hurt? Why would I care if [Cardiff Electric boss] Bosworth is a little ticked off that I had taken over his company? [Laughs] There’s a bigger purpose. Now, some might say that’s sociopathic, but it all depends on whether or not Joe wins. If he wins, if he succeeds in what he set out to do, then he’s a risk-taker. He’s a pioneer. He’s someone who overcomes obstacles. If he fails, he’s an a–hole. TVLINE | This might be a question for the producers, but is it just a coincidence that the word “Mac” is in his last name? Yeah. Question for the producers. I didn’t choose the name. I love it. When I would write emails to them, I would refer to him as the Joe Mac. [Cameron is] Cam Dos. TVLINE | There’s sort of a slick Don Draper salesman quality to him. It’s a mask. When I say in the pilot episode, “I’m done doing business like that,” he means it. But that way of doing business is effective. So if I have to wear those shoes to get in the door and then start running this thing the way I want to run it, I’d better wear that mask for a while. But you tell me if you think he’s like Don Draper after Episode 3. TVLINE | He’s a much darker character than Ned the pie maker. Was that really appealing to you to shed that image? TVLINE | People really connected with Pushing Daisies. They still love it. What do you think it is about the enduring appeal of that show? I don’t know. I remember doing [press] forPushing Daisies, launching the show, and trying to explain what it was about. “Ned can touch dead people back to life, and if they lived for longer than a minute, then someone else would die. And if I touched them for a second time, then they would die. And I touch my child sweetheart back to life, then I can never touch her again.” It’s a such a only-out-of-the-mind-of-Bryan-Fuller kind of show. It’s one of those magical, odd things. I don’t know what it is. But I do know that I fell in love with Anna Friel, absolutely fell in love with her. I saw her in New York recently because she’s doing a new show this season [NBC’s Odyssey]. We had such high hopes for [Pushing Daisies]. We’re proud of it, made something special. And it means so much to me that people, even if they didn’t discover it at the time, are starting to discover it now because we worked hard on it. Lee talked to HitFix his Halt and Catch Fire character Joe MacMillian and his other recent work. Lee Pace: Man, I can’t even tell you how. I mean it’s been this past year living out of a suitcase. We shot the pilot in April, went from Atlanta to London, did the first tests for Ronan, the kind of costume and make up and all that stuff. Went from there to New Zealand, shot my pick-ups for the “Hobbit.” Went from there back to London, did that whole crazy, f***ing movie. I mean the craziest thing I think I’ve ever been a part of was that movie. And then basically went from that right into this. Wait. No! No, no, I went from that into Stephen Frears’ movie about Lance Armstrong. Why I thought I needed another movie in there, I don’t know. And then I just finished this about a month ago so I’m like home and finally get a chance to have a life. HitFix: How much of it is sort of a compulsion to work? How much of it is projects that you just couldn’t turn down, et cetera? Lee Pace: One hundred percent both. I mean I’m a big believer of when jobs are coming, grind it out. Do it! Because they don’t always come for actors, you depend on getting cast. I mean, God, just this incredibly cool stuff kind of fell into my lap. This has been just an incredible experience and “Guardians of the Galaxy” was just… I mean… did you see the trailer? Lee Pace: It’s pretty wicked isn’t it? Lee Pace: Yeah, yeah. I’m really excited about this character. I mean he’s nuts. I mean I’ve never played anything like it and I’ve had such a good, it’s one of those things where you don’t know how to approach something like this. This is not Joe MacMillan. You can’t think, “Well, you know, this is my relationship with my father…” It’s not that. There’s none of that, you now, kind of “This is how I would go about dealing with these problems.” It’s a complete kind of act of imagination. But in the hands of James Gunn, I’m such a fan of his movies. So it’s very much a creation of his and I found my self being like, “Alright, let’s do it. You tell me what you’re into here. Lee Pace: I mean you sit down with him for 10 minutes and you know he knows what he’s doing. I mean he’s just making the movie that he wants to see. I mean that’s a filmmaker. And it’s just a privilege to work with someone like that. You know, Peter Jackson is the same way. He’s going to make the movie that he wants to see. And to be a small part in one of those is so cool. Because they have thousands of people work on these movies, thousands and there’s so many different layers. So my performance is just a small, small part of that puzzle. Creative and fun, working on these massive movies has just been so much more fun than I’ve ever dreamed it could be. HitFix: Well, just in terms of sort of imagination and foreigness and in terms of out there in outlandishness… You know… “Hexadecimal code” and whatever the heck these motherboard things are doing, is that a language you speak? Lee Pace: No, but it’s hardly a language Joe speaks either. Joe doesn’t know a lot. He knows, he understands the basics of this, but he doesn’t understand the cutting edge technology that he needs Gordon to create. It’s Gordon’s business, he just needs to push Gordon to do it, to make it. What Joe has in mind is an awesome computer, the computer that no one else has the balls to build. He doesn’t even know quite what that is. He knows it needs to be cheaper, it needs to be faster and it needs to be smaller. That’s what he knows. And that’s going to be tough to do. And he knows it’s going to be tough to do and he knows it is going to be even tougher to get people to buy it. AMC said goodbye to Breaking Bad last year, and they’re already prepping next year’s Mad Men swan song. With the loss of the two series that put them on the map for award-winning original programming, it’s time for a new series and a new star to shake things up on the network. Enter Halt and Catch Fire and its leading man Lee Pace, who’s not letting the media pressure get to him. And while Pace gave props to his personal TV favorites like Breaking Bad and Netflix’s House of Cards, he didn’t take this new gig just to follow anti-hero suit: “Joe’s a character that I’ve never seen before on television,” he said, referring to Joe MacMillan, his renegade former IBM exec character who sets out to beat the computer pioneers at their own game. MacMillan decides to reverse-engineer the IBM PC with help from his ragtag team, engineer Gordon Clark (Scoot McNairy) and prodigy Cameron Howe (Mackenzie Davis). “I think he despises everything they stand for and the IBM corporate culture… you hear these crazy stories, which are true, of people in black or blue suits, modest coat and tie, white shirt, certain kind of haircut. It was the picture of corporate. I think he sees that and says, ‘That’s f—ed. It can be better than that, it can be more than that, and it needs to be. It has to be.’ That’s why he picked people like Gordon and Cameron to go on this journey with him because he’s not interested in doing it that way. “I want there to be something inspiring about him. It’s not about the money. It’s never about the money. Money’s not interesting. Ideas are interesting, culture is interesting, and that’s what he’s hoping to be part of. And Pace is at a similar point in his career, returning to TV after a five-year hiatus, taking a chance on a third television series, while his film and theater career are stronger than ever. He’s also treading into uncharted waters, creatively, considering his two previous shows, Pushing Daisies and Wonderfalls, were both created by the same man, Bryan Fuller. The article came with a beautiful promotional high-quality shot, which has already been added to our gallery. 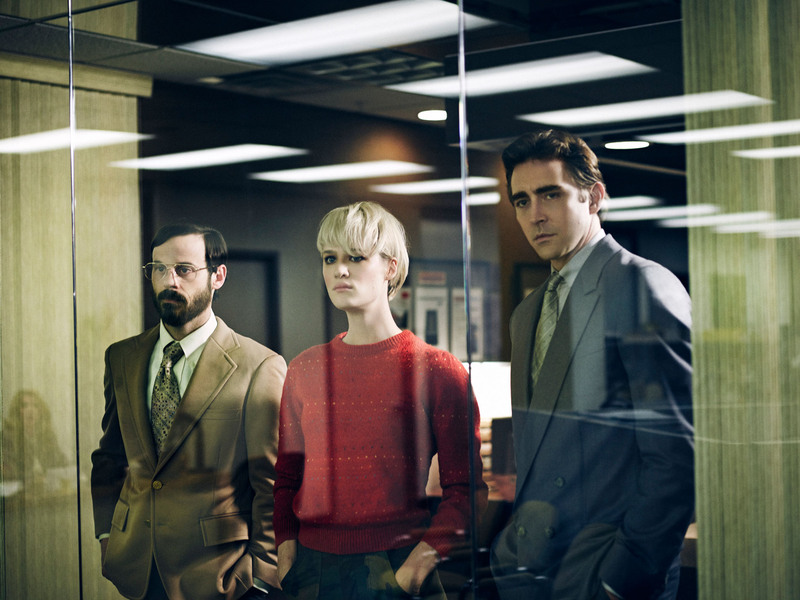 Halt and Catch Fire premieres Sunday, June 1 at 10 p.m. on AMC.